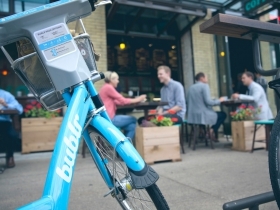 Bublr Bikes hit the streets of Milwaukee. 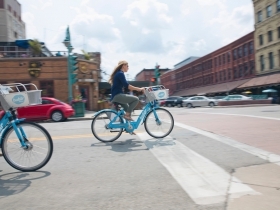 As of today, Milwaukee can be added to this list: New York City, Chicago, Minneapolis, Madison, Denver, Houston, Washington, and Indianapolis — just some of the major American cities operating bike-sharing systems. 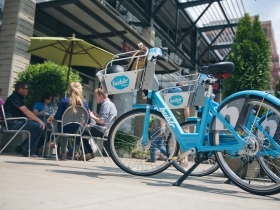 Bike-sharing systems allow people to rent bicycles for short term use, often 30 minutes. Riders use a credit card to checkout a bicycle at a docking station and can check it back in at any other station within the system’s network. This allows residents, workers, and tourists to use a bicycle to grab lunch, get to work, or go see the city. Station location. Click image for pdf. In 2015 the system is scheduled to expand to as many as 35 stations with up to 300 bikes. These new stations are planned for the Historic Third Ward, Bay View, King Drive, Brady Street, the Menomonee Valley and the East Side. 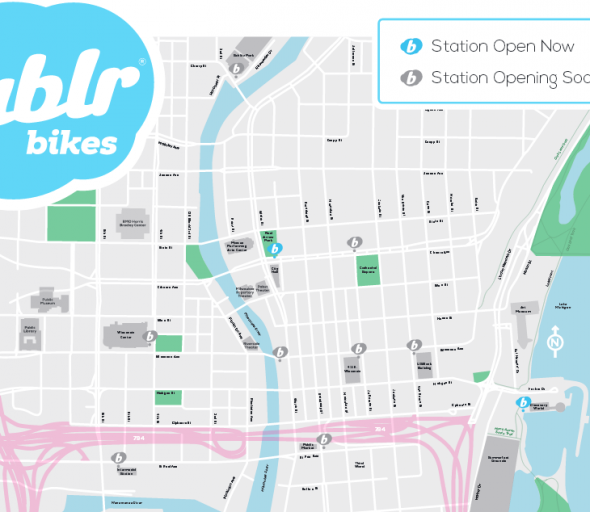 Over the next few years the system could grow to 100 stations and 1,000 bikes throughout the Milwaukee area. 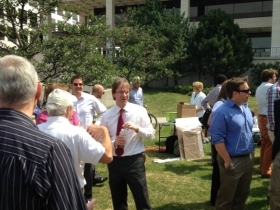 And in 2016 the system will expand to include the suburbs of West Allis, Wauwatosa, and Shorewood. Just this week these suburbs received approval from WisDOT for $399,360, $426,634, and $398,607 respectively in federal Transportation Alternatives Program funds to help them install additions to the bike-sharing system. 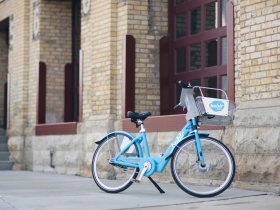 In addition to rolling out new bikes and docking stations, Midwest Bikeshare will implement a traditional bike-sharing pricing structure to replace the pricing structure that’s been in use at the Discovery World station. The new rates will range from $7 for a day pass to $20 monthly for unlimited trips under 30 minutes each, additional charges will apply for longer trips. 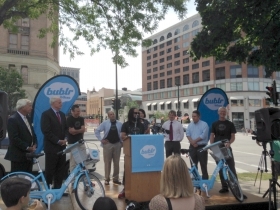 Also announced today was the name for Milwaukee’s bike share system: Bublr Bikes. 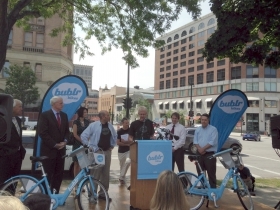 “Bublr Bikes will put Milwaukee on par with our peer cities and generate excitement for people of all ages,” said Mayor Tom Barrett in the release. 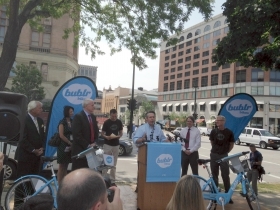 MGIC Chairman and CEO Curt Culver added that his company was supporting Bublr Bikes because it would help attract young talent and business to Milwaukee. 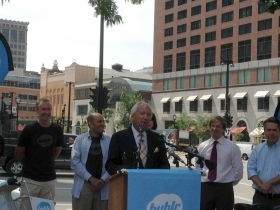 “I encourage other Milwaukee employers to get behind Bublr Bikes and help make downtown and nearby neighborhoods even more exciting and vibrant,” Culver said. Midwest BikeShare had raised nearly $3 million to fund the system with more than $1 million of the funding came from over two dozen private donors, including Mandel Group, MGIC, the Astor Street Foundation, The Pabst Theater Group, Schlitz Park, the US Bank Center, the Brico Fund, the Milwaukee Development Corporation, Lakefront Brewery, the Greater Milwaukee Foundation, Dermond Property Investments, Rockwell Automation and others. Hardman added that an additional $3 million will be needed to expand the system to 1,000 bikes. 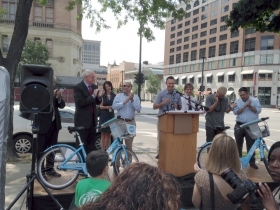 “We greatly appreciate the leadership of these private sponsors and urge other private sponsors to join us in bringing bike sharing to the people of Milwaukee,” Hardman said. The City of Milwaukee will also receive $412,692 in TAP funds to install bicycle plates on the N. Emmber Ln. and N. Plankinton Ave. bridges. On Friday August 22 from 6:00 p.m. to 11:30 p.m. the Bicycle Federation of Wisconsin is holding the Polish Moon Ride & Block Party. The 11 mile fundraising ride leaves at 8:00 p.m. and will take riders through historic Polish neighborhoods on Milwaukee’s near south side. Registration is available on the Bike Fed website here. Rumor has it that there will be a post party ride to Kochanski’s Concertina Beer Hall. That’s a fair point. And I do think that the stations make sense when you take the perspective of making it as easy as possible to move within downtown. It just looks like they have stations in all the commercial pockets of downtown and not in any of the major residential pockets. I realize that part of it is “so-and-so paid for a station, so they get one” and part of it is the very limited initial roll-out (i.e. I can see a couple places where I would like to see a station but wouldn’t be able to pick a station I’d remove). Very excited to see where they end up next year. Regarding the comment: ya I dropped the ball on that one. The entire comment is an embarrassment really, my apologies that you spent time reading and responding to it :). Awesome news!! Definitely looking forward to it’s expansion so that it will really be useful to residents as well as downtown workers. Not a fan of the name though…. Great news. I especially applaud the naming because it not only references something Wisconsin-specific but is also a nod to Milwaukee’s emerging “brand” as a city for water technology, research, etc. And of course, just like a regular bubbler, these bikes are a shared resource–something for everyone to use. Whoever thought of the name was pretty sharp. 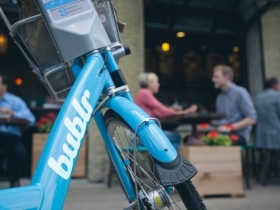 I do want to point out that, according to the Bublr Bikes website, there will also be an annual membership options. For 2014, it will be prorated to $35, but I imagine it will be in the $65-80 range next year (which is typical for these systems…MN Nice Ride is $65, Divvy is $75). 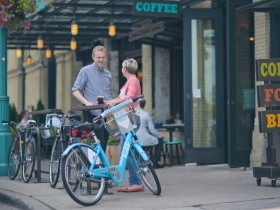 I use Divvy regularly as a Chicagoan, and I’ve gotta say the annual membership is the way to go here, and I think it will be in Milwaukee once the system expands a bit. My daughter has been MD in emergency rooms. She was state champ bike racer. The injuries that they see the most is from bikes, so I hope that everyone has the sense to push safety. helmets, bright clothes, strobe lights, watch traffic. The life you save will be your own as you will barely dent a car. Sheboygan jsut published the federal study on their grants from the feds and the bikes the last few years. Not very good. You can access at media trackers or Sheboygan. We love cycling, have 4 bikes use them almost everyday of year when there is not ice on streets. All 7 in our family have raced. but, safety first. Many times the first collision with a car is your last. Is this the study you are referring to? Safety: Despite large increases in nonmotorized transportation, the pilot communities collectively observed a 20 percent decline in the number of pedestrian fatalities and a 28.6 percent decline in the number of bicycle fatalities from 2002 to 2012. Similarly, over the same time period, three of the communities experienced declines in the number of pedestrian injuries and pedestrian injury rates declined between 17.9 percent and 55.1 percent in each of the four communities. Bicycle injuries increased in three of the four communities, but bicycling injury rates (incidents per number of trips) declined between 8.6 and 38.2 percent in each of the four communities. Public Health: Based on the added bicycling trips observed just in 2013, the U.S. Centers for Disease Control and Prevention (CDC) estimates reduced economic cost of mortality of $46.3 million from bicycling in 2013. This does not include reduced economic cost of mortality from walking or benefits from reduced economic costs of morbidity, which are likely higher than mortality. So, pedestrian and bicycle fatalities declined, while public health improved. So what do you mean when you say that the results are not very good? Similar results in Boston and Washington D.C. as well.. If you access the article on Media Trackers you will see that after spending half a million of taxpayers money there was not any increase in bike usage. Right cause Media Trackers is such a reputable source. No increase in bike usage? Huh? Mode Share Shift: An estimated 85.1 million vehicle miles traveled (VMT) were averted from increased nonmotorized trips between 2009 and 2013 relative to the 2007 baseline. The walking mode share increased 15.8 percent from 2007 to 2013, while the bicycling mode share increased 44 percent over the same period. This translates to 22.8 percent and 48.3 percent increase in the number of pedestrian and bicycle trips across the four communities. So we have a decrease in pedestrian and bicycle fatalities, an improvement in overall public health, and an increase in the number of bicycle trips. How is that very bad? @PMD Just to be clear the report your citing is the overall results of Nonmotorized Transportation Pilot Program (not just Sheboygan) correct? From what I read is that the program his increase walking and bicycling mode share and decreased injuries per trip… Yup. Yes the results from 4 pilot programs including Sheboygan. Is there an explanation for the name? Bublr? Ah it is a reference to Milwaukeean’s calling drinking fountains Bubblers and the city’s ongoing water efforts (Reed Street Yards, Global Water Center). It connects a bit with our history and with the unique spelling to today’s modern tech world (think flickr). I am using the Sheboygan figures, they are representative of Wisconsin and it’s weather. anything else is meaningless. Sheboygan is pretty much regular Wisconsin city. I enjoy cycling, encourage it, but safely, as it is true if you do your research about emergency rooms. Check it out everyone. We have PMD here throwing out all kinds of meaningless figures. Fact is that it is highly unlikely that Wisconsin will dramatically increase bike usage cause of weather. May through Oct. is max for 90% of people, nuts like me ride all year round. The safety factor for people that have not ridden, in years, is a factor plus the kids are not riding that much, any more. We live next so school and I see adults coming by, heading for bike path, but few kids in the 10- 16 age group. A closer look at the breakdown by community does reveal that bicycle usage in Sheboygan remained flat over a 6-year period. However, I still don’t see how that makes the program a failure. It hasn’t been marketed in the area and that changes this year, with support from the Chamber of Commerce. Walking increased by 85% during that period, which means there was an improvement in overall public health. Safety also improved. While there was only 1 bike fatality in Sheboygan over a 10-year period, in 2003, bicycle injuries dramatically decreased in Sheboygan. So you have more walking, better public health, improved safety, and an increase in accessibility and visibility for bicycle users. Plus after a marketing campaign you’ll probably get more bike usage as well. You have to engage in a lot of spin to claim the program is a failure for Sheboygan. Again, safety improved in Sheboygan. And if you are that worried, you shouldn’t drive, ever, as you are far more likely to die behind the wheel of your car than on your bike. @PMD Also I find it interesting many of the improvements were just finished last year and the trail isn’t even done yet so maybe media trackers it a bit premature. No doubt Dave Reid. I think it would be wise to take anything from Media Trackers with a grain of salt. Spending millions of dollars on left wing programs that accomplish nothing is standard for the govt. But the accomplishments were listed. More walking, improved public health, far fewer biking accidents, enhanced accessibility and visibility for bikers. Are you intentionally ignoring those? Or are you claiming that those are not accomplishments? I don’t care for the name. The word “bubbler” means nothing to anyone from out of town, and would not obviously invoke thoughts of water. Also, the spelling is so 10 years ago (“web 2.0”) and makes us look dated. Great start with Bublr! Love the name. Very Wisconsin! Would be great to expand stations to retail/gathering areas like North Ave, Downer St, Locust St, KK, etc. Maybe partner with Colectivo to locate by their cafés. If you keep the bike overnight, is it still $7 per day or is there a penalty for keeping it longer? How are bike maintained through the winter? Wouldn’t want rusty bikes in the fleet, plus not safe riding in the snow or ice. Comments? Eh, the name’s a name. I’m not in love with it but don’t think it’s bad either. As Dave mentioned the bikes are intended for point to point trips. In theory you never really have the bike checked out unless you are actively riding it. To provide a more concrete, real life example: in Chicago my place is a bit over a mile from the train station. When I get off the train I use my Divvy key to pick up a bike, then ride to the station nearest where I’m going (usually a block or two), return the bike and walk the rest of the way. If you want to take a longer, more leisurely ride you can “dock surf” or ride for 25 minutes then check the bike in at a dock and immediately check it out again. The only catch is that, if there are people waiting for a bike, you should give your’s up and move to the back of the line. (A well managed system will rarely have docks that are empty or full but it can happen). Regarding winter: I saw somewhere (I think on their site) that the expected season will be mid-March to mid-December, depending on the weather. The bikes can handle winter just fine, so shutting down has more to do with cutting operating costs when ridership drops than anything else. In Chicago Divvy operated all but a few days last year, during one particularly bad storm and the extreme cold periods. Even then it was less about biker safety than it was about the safety of the employees operating the system. I got an email from Kevin (the one in charge of Bublr) saying that installation of the other 8 racks should begin August 18th. I personally can’t wait. It will only take 2.5 years of everyday use for each bike to pay for itself. Hopefully those bikes will last that long. This is tough area for bikes with weather and traffic. The bublr lefty, hug a tree, take a pipe and make it a bike, is government waste and leftist disillusionment at its highest order. It might make sense for 3 cities and a few island nations, but for everybody else it’s just a money pit.